Tomorrow night at International House Philadelphia, superb jazz and improvised-music presenter Ars Nova Workshop hosts the first concert of a short tour by the Celestial Septet—a collaboration between ROVA, a San Francisco group that helped put the saxophone quartet on the jazz map in the late 70s, and the Nels Cline Singers, a muscular, flexible trio led by the guy known around these parts as the lead guitarist in Wilco. Last year the combined group released a superb self-titled debut on New World Records. 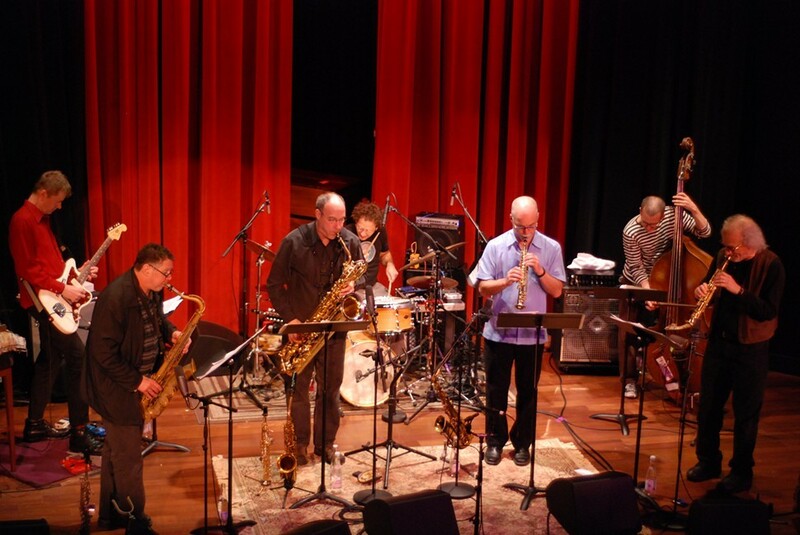 Cline's expansive trio (which on the recording includes drummer Scott Amendola and bassist Devin Hoff) brings roiling grooves and searing intensity, and ROVA's four horn men—Bruce Ackley, Steve Adams, Larry Ochs, and Jon Raskin—pile on with waves of post-Coltrane extrapolation, constellations of pointillistic rhythm, and fiery tangles of all-out blowing. Unfortunately, the Celestial Septet tour doesn't come to Chicago; its other stops are in New York, Boston, and Amherst, Massachusetts. Ars Nova has arranged for a free webcast of Tuesday's concert, though, which will feature bassist Trevor Dunn instead of Hoff, who moved to Chicago last year and parted ways with the Nels Cline Singers (though he and Cline will play together at the Hideout on March 9 in a quartet with reedist Dave Rempis and drummer Frank Rosaly). To register for the webcast, which begins at 7 PM Chicago time, interested listeners should head to the presenter's website.